Directions: Click on a picture, below, to go to that event's picture page. Once inside a gallery, use the arrow buttons to navigate. Click on the "Pictures" link at the top of the picture page to return here. You can also find a variety of videos on SUPA's YouTube site: http://www.youtube.com/seattleukulele. Google now only allows linking to specific albums, and not to all the albums for browsing. So, here are links to specific albums over the years. SUPA December 2016 - Holiday Potluck Extravaganza! August picnic at Woodland Park with food, entertainment, and open mic. Rubber duckies and bathrobes in the Solstice Parade. Northwest Folklife Festival performance in the Intiman Theater. Get together for fun and recording. Song circle and workshop led by John L.
Song circle and workshop with Pekelo. Song circle and workshop with Del Ray. December 9, 2006 - Performing holiday tunes for passersby at the annual Pathway of Lights festival. Brief TV appearance, too (YouTube Link). November 19, 2006 - Hosted by Win, we recorded the SUPA holiday album, and ate lots of food. October 15, 2006 - Continuing the mid-month song circles, Carel hosted a recording session. September 25 - SUPA takes the crowd out to the ball game for the Mariner's Hawaii Night. 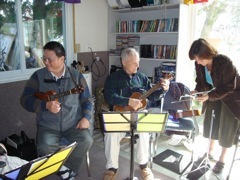 September 23 - Cath hosted her annual uke day on Vashon with lots of food, fun, and music. September 23, 2006 - Aaaargh! SUPA helped to start Seafaring Family Fun Days on South Lake Union. June 2006 - A variety of pictures and performances from the Portland Ukefest, attended by several SUPA members. June 17, 2006 - We're Back in the Saddle Again while ridin' the open prairies of Fremont in the annual Solstice parade. May 28, 2006 - Hana Hou! Ukulele Show! at the 2006 Northwest Folklife Festival. April 29, 2006 - Ukulele performance at the Country Village in Bothell for Ante Nani's Li'l Grass Shack - rain, cold, but excellent malasadas! December 3, 2006 - Annual Holiday Potluck song circle at West Seattle with open mic. November 5, 2006 - Workshop by Jere Canote and song circle at Ballard. October 1 - Lively workshop with Jim D'Ville and song circle in West Seattle. September 10 - Song circle in Ballard with a workshop presented by John Leder. August 6 - The annual SUPA picnic at Woodland Park with lots of fun, open mic, and food. July 2, 2006 - Song circle at Dusty Strings are part of their UkeFest 2006. June 4, 2006 - Song circle with some lots of member participation and leading. Quicktime movies available of Where or When with Susan and John leading and Mr. Sandman with a view around-the-room. May 7, 2006 - Song circle with a bit of a cowpoke twist. April 2, 2006 - Song circle and workshop with Howlin' Hobbit. Special guest visit by David Kamakahi. March 5, 2006 - Song circle in the newly renovated West Seattle senior center. Annual swap meet and flea market. February 5, 2006 - Pekelo's pickin' workshop and song circle. Special visit and interviews with Bill and Gloria for their Hawaiian television program. January 8, 2006 - Workshop with Gregg & Rod helping with our Hawaiian pronounciation. Song circle fun. December 10, 2005 - SUPA performs at the Green Lake Pathway of Lights Festival to a rousing, cold crowd of holiday merry-makers. October 23, 2005 - SUPA performs in the spirit of intercultural friendship at the Austrian-American Day and Austrian National Day celebration sponsored by the Austrian-American Council and the Austria Club of Washington. September 29, 2005 - Several SUPA members visit with Jake Shimakuburo after the concert. September 4, 2005 - SUPA backstage for the Volcano Stage at Bumbershoot. 15 minutes of fame, and lots and lots of rain. More pics. September 3, 2005 - Music rehearsal and run-through in Shoreline for our Lava Lagoon performance at Bumbershoot. More Pics. August 27, 2005 - SUPA performs for Lower Queen Anne's Uptown Stroll arts festival. August 13, 2005 - SUPA performs at the Whidbey Island Tilth Farmers Market with Fran doing lots of hula. July 16, 2005 - SUPA makes its annual appearance at the Northwest Railway Museum in Snoqualmie for the Day Out with Thomas the Tank Engine. June 5, 2005 - SUPA was invited to participate as the "break music" for a bone marrow benefit. May 29, 2005 - Ukulele Jam Session on the McCaw Promenade. May 29, 2005 - Ukulele Extravaganza at the Northwest Folklife Festival featuring Rod Lopez Sr., Kimball Elementary Ukulele Ensemble, and the Seattle Ukulele Players Association. More Pics: Pam's, Gregg's. April 30, 2005 - Edmonds in Bloom Festival performance by SUPA troopers. 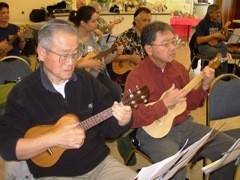 February 5, 2005 - SUPA performed their ukulele magic for the Sacred Heart Parish in Bellevue for their annual dinner. 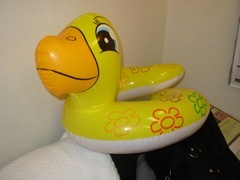 This year's theme: luau, of course!. January 29, 2005 - SUPA was the entertainment for St. Demetrios' benefit luau supporting the All Saints Camp & Retreat Center. December 4, 2005 - SUPA's annual holiday potluck and open mic. Tons of food, lots of fellowship, and great 'uke playing! November 6, 2005 - SUPA song circle with Gregg Porter doing a workshop on several Hawaiian songs and pronunciation. October 2, 2005 - SUPA song circle and workshop with Uncle Ben & Marge Hunt teaching Hawaiian tunes, strumming, and pronunciation. September 11, 2005 - SUPA song circle with John & Rod conducting a workshop. Several open mic opportunities, and a fond farewell to Charlie as he returns to France. August 7, 2005 - Ukuleles in the Park. SUPA picnic at Woodland Park complete with entertainment, open mic, song circle, and barbecue. More pics. July 10, 2005 - SUPA song circle with Rodney Lopez conducting a workshop on unique ukulele stylings. June 5, 2005 - SUPA song circle with special guest Jim D'Ville conducting his Natural Way workshop at Dusty Strings. May 15, 2005 - Rehearsal for our Northwest Folklife Festival performance. May 1, 2005 - SUPA workshop with John Leder and Gregg Porter teaching us a little bit of Hawaiian pronounciation. Song Circle with special performances. April 4, 2005 - SUPA workshop, led by John Leder and Uncle Rod, and song circle. Special hula by Gregg "Birthday Boy" Porter. March 6, 2005 - SUPA song circle with a swap-meet and social hour beforehand. Special performance and hula by Rodney and Susan Lopez. February 6, 2004 - Our new home at the Ballard Senior Center. 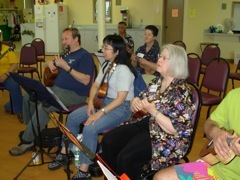 Ukulele workshop was provided by Jere & Greg Canote who also showed their talents in a special concert for us. January 9, 2005 - SUPA song circle held at Dusty Strings celebrating our 2nd anniversary.